Our main goal is a satisfied customer. 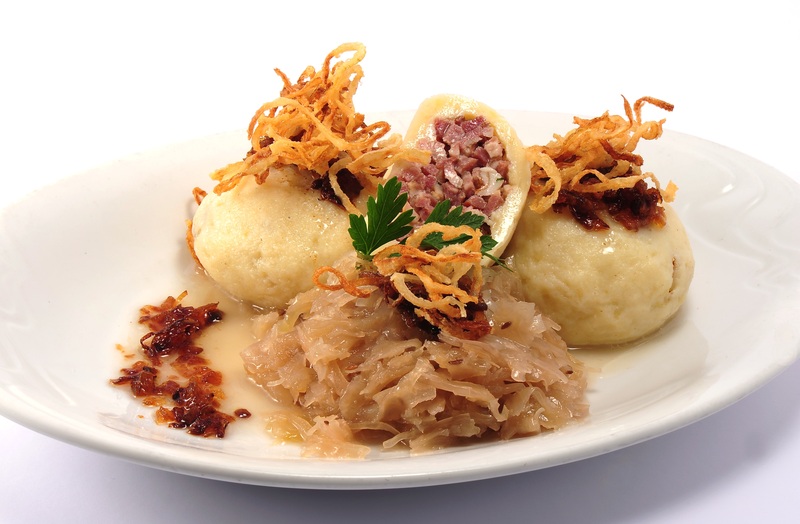 Excellent service, friendly staff, customer-oriented individual approach and above all delicious cuisine. We are a non-smoking restaurant. 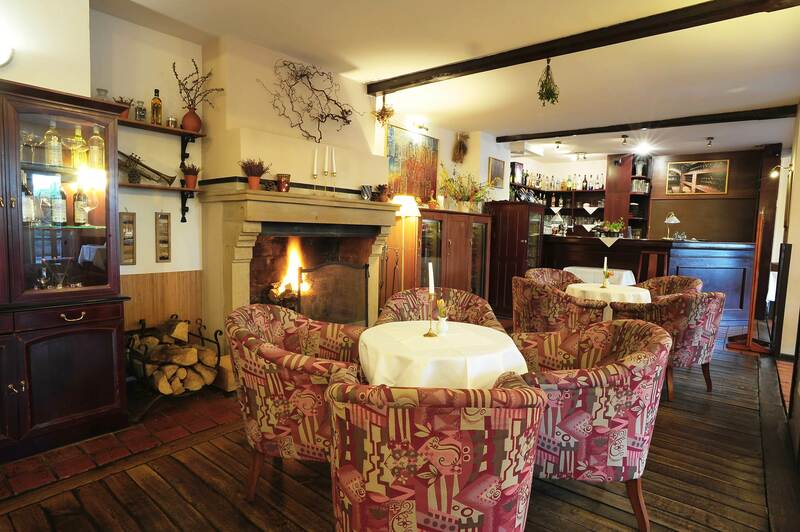 Cosy environs – a fireplace hearth, a restaurant garden surrounded by trees and flowers. We offer rich and varied breakfast as well as business breakfast (served 07.00 am -10.00 am). Company parties and family celebrations, e.g. weddings, birthday parties, anniversaries etc. There are 4 lounges for ca 10 - 80 people. 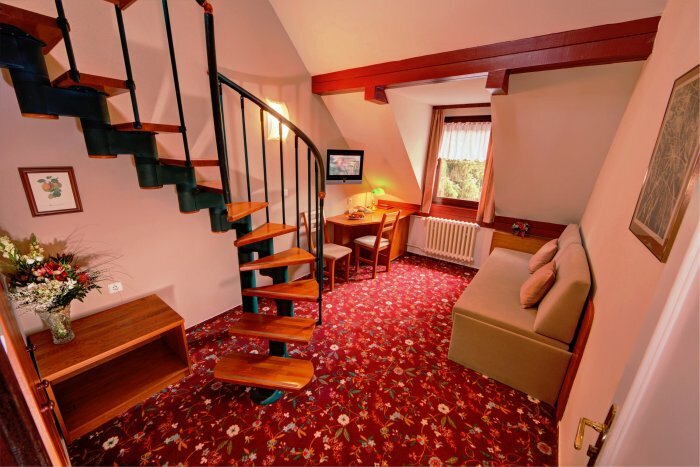 Guests accommodated in Parkhotel Průhonice get a 10% menu discount. 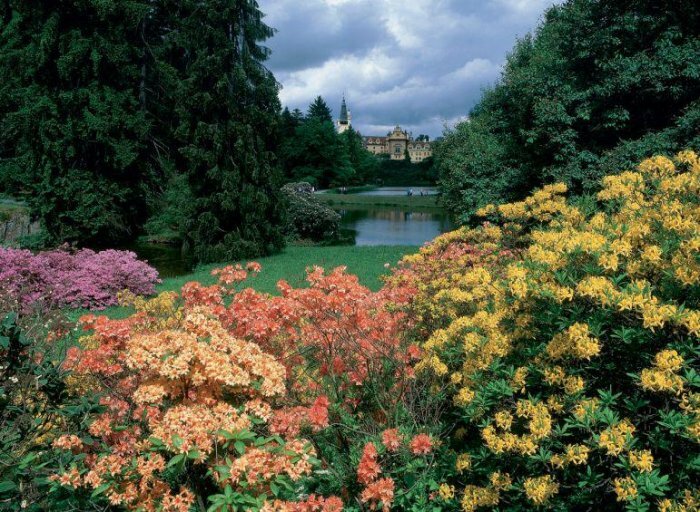 Quiet location near magnificent Průhonický Park with the Castle and the dendrological garden. The City of Prague can be reached easily – by car or public transport (only 14 km via the D1 motorway into the centre). The hotel is located near AQUAPARK Aquapalace Praha Čestlice. We accept credit cards: VISA, MasterCard, Maestro, JCB, Diner's Club. Průhonice is a beautiful and romantic spot in the vicinity of Prague. It is part of Prague and yet it is situated outside of Prague. What awaits you here? The castle, the castle park, a shopping area as well as our restaurant. This is all worth visiting. Průhonice - Čestlice u Prahy. The whole family or your company will be greeted in Průhonice by friendly, helpful and professional staff , who will make sure you spend unforgettable moments here. You will surely appreciate a cosy, peaceful and discreet setting also highlighted by a dominant feature of our restaurace – a fireplace hearth and a garden restaurant. Isn't it tempting? 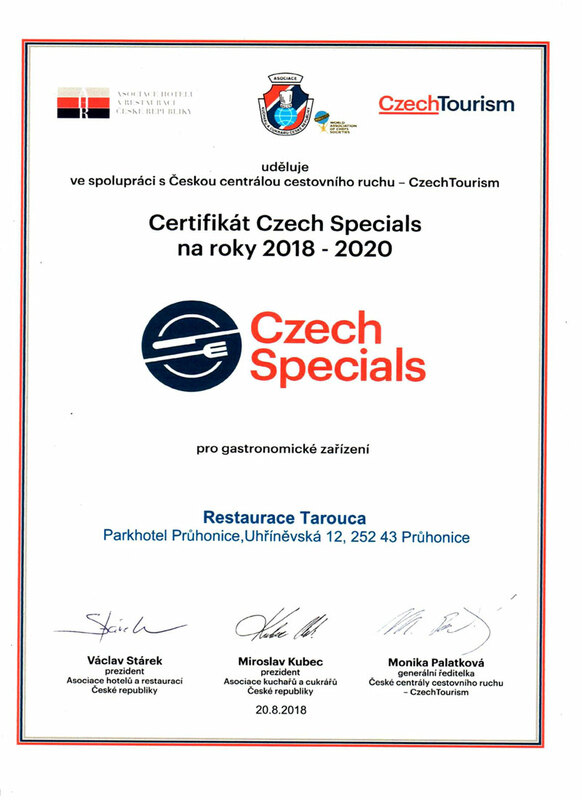 Milan Ballik, one of the best-know and most critical gourmet-reviewers in the Czech Republic tested our cuisine and wrote an independent review. 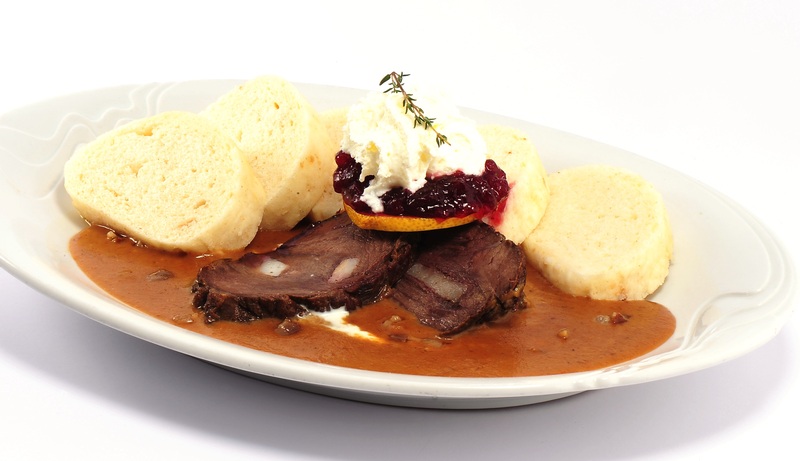 He mainly appreciates a simple, honest menu and a kind customer-oriented approach. After reading his view, you will certainly be curious about our menu. Everybody can find „their own“ favourite dish. We want to make our guests feel at home, which is why they are greeted by a „cosy“ restaurant. An oasis of peace and comfort, a cultural spot not only for the hotel guests, but also for all those who can appreciate good meal and friendly staff. 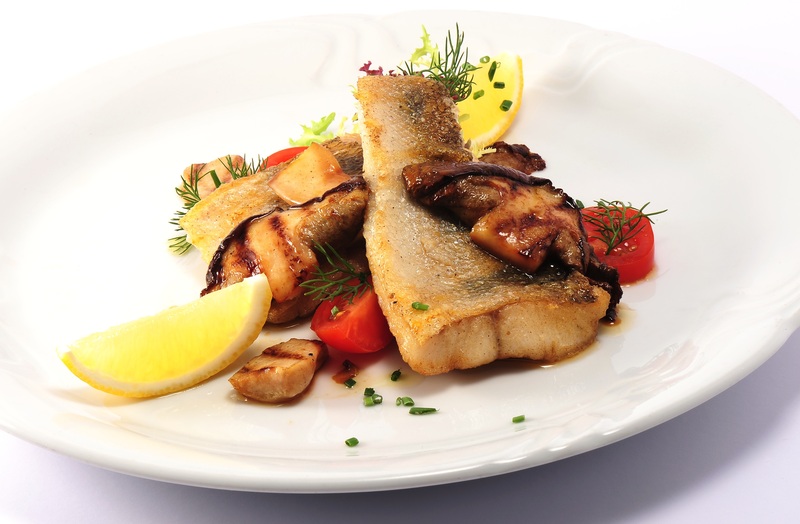 The atmosphere is successfully crowned with our menu offering a considerable choice of our and classic specialities – such as steaks, fish and special salads. We are proud of the wide range of wines carefully selected from the renowned areas of Moravia, Italy, France, Spain, Austria, Germany and Argentina. All of this at reasonable prices. Invite your friends to enjoy a glass of excellent wine from our cellar! In summer months, our guests can enjoy their relaxation on a very nice garden terrace with a tempting offer of refreshing drinks. The cooling shadow of our garden restaurant will be much appreciated by the adults as well as by their children. Information on allergens will be provided by the staff upon your request. Are you expecting a big event in your family or your company? We will assist you in organizing the social event according to your wishes, the so-called tailor-made! Trade dealings, company events – parties, banquets, feasts, cocktail parties and family celebrations, such as weddings graduation and birthday parties, wake ceremonies etc……nothing is impossible. 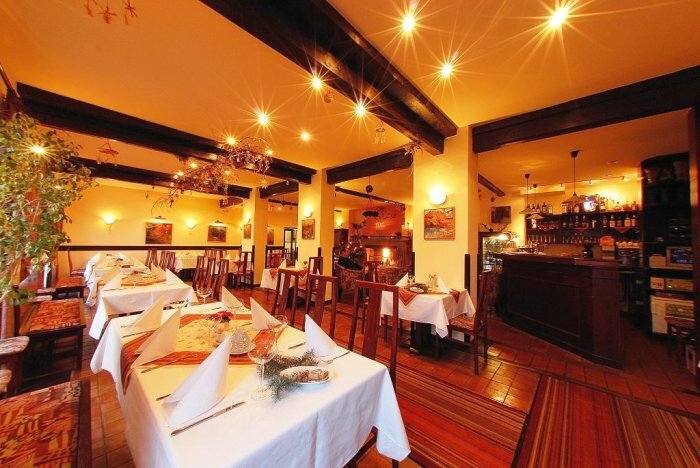 We gladly help you with the arrangements and offer you the venue of our Restaurant Průhonice. For groups and private parties by prior arrangement. We offer gift vouchers (the amount of consumption as per your wish). SPHERE Card holders receive a 10% discount on consumption (max. 8 people) – of the current menu prices. 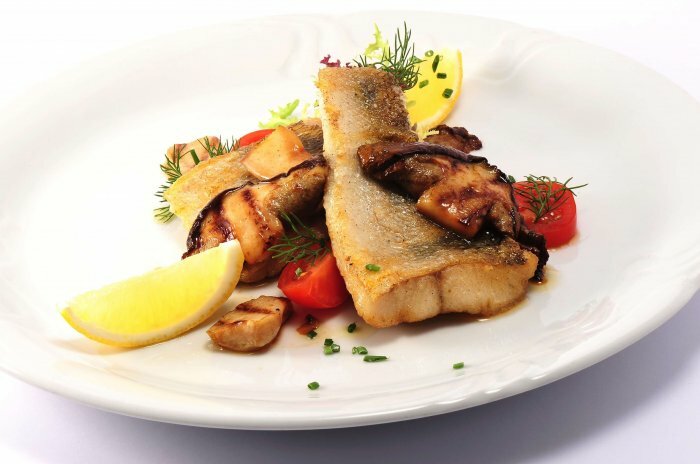 Restaurant Tarouca is situated in Parkhotel Pruhonice, which is conveniently located near Prague and Pruhonice Park. An ideal choice for restaurant Pruhonice, restaurant Prague, restaurant Prague 10, restaurant Cestlice, restaurant Prague 4, restaurant Prague 4 Chodov, restaurant Chodov, restaurant Waterpark Cestlice, restaurant Aquapalace Prague Cestlice, wedding Pruhonice, weddings Pruhonice, wedding reception Pruhonice, wedding Prague, weddings Prague, Prague wedding reception, breakfast Pruhonice, business breakfast Pruhonice, breakfast Prague and business breakfast Prague. Its location isn´t advantageous only in Pruhonice but also for guests from Pruhonice, especially when visiting Prague and the Waterpark in Cestlice. The restaurant Tarouca accept payment cards as follows: VISA, Euro Card - Master Card, Maestro, JCB, Diner's Club.